Question: I'm interested in the sludge dewatering bags. Our client is a mining company. They work to produce a slurry of 55 percent silt and water and carry that slurry for 23 kilometers in a pipe. At the end, he wants to create a solid levee with a system that will let the water out and construct a wall with bags piling one over the other. The bigger the bag, the better. The customer will operate for 15 years on a 200 hectare site. The sludge dewatering bags will be left in the sun and eventually covered with earth. What do you have to offer as a solution? We want the biggest bag filter for sludge dewatering you have. We also want to know what happens if the bag is punctured when it is still full of water? How long does it take to empty all its water content? How do we fill the bag? Answer: Due to the size that you require, you will probably want to use is the Geotextile Dewatering Tubes rather than the dewatering bags. The tubes, also known as sludge tubes, are designed specifically for large or demanding dewatering projects. This has included sludge dewatering, lagoon projects, and work in mines. Questions about a bag filter for sludge dewatering? We can help! Call the GEI Works team at 1-772-646-0597 or fill out our quote request form to discuss your requirements. 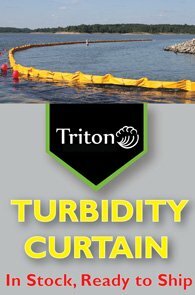 If geotextile dewatering tubes are punctured while filled with water, they will leak. If they are filled with dried sand or sediment, the material will stay. This fabric dewaters at between 14 and 20 gallons per square foot per minute. The time required to remove all water depends on the contents being filtered and the amount of water pumping into the sludge dewatering equipment. Polymers may be used to increase geotubes sludge dewatering times. Geotextile dewatering tubes can be filled through ports located evenly throughout the sludge tube. The ports are 10 inches in size, providing plenty of room for the fill hose. The number of filling ports depends on the size of the tube with one port for every 50 foot length. Tubes include between 1 and 5 ports. Questions about geotubes sludge dewatering? Give us a call at +1-772-646-0597 or fill out our quote request form to discuss your requirements.